If a woman gets diabetes or high blood sugar when she is pregnant, but she never had it before, then she has gestational diabetes. Why didn't I have diabetes before? Remember that only pregnant women get gestational diabetes. When you're pregnant, your body goes through a lot of changes. In this case, being pregnant changed your metabolism. 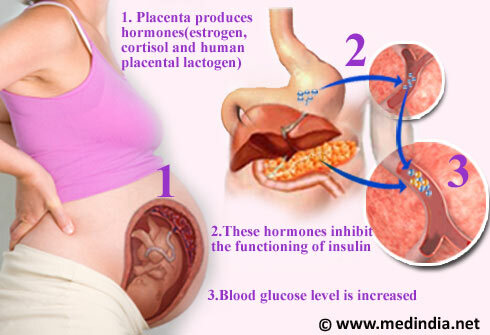 The placenta, (the system of vessels that passes nutrients, blood, and water from mother to fetus), makes certain hormones that prevent insulin from working the way it is supposed to. This situation is called insulin resistance. To keep your metabolism normal, your body has to make three times its normal amount of insulin or more to overcome the hormones made by the placenta. For most women, the body's extra insulin is enough to keep their blood sugar levels in the healthy range. But, for about 5 percent of pregnant women, even the extra insulin isn't enough to keep their blood sugar level normal. At about the 20th to the 24th week of pregnancy, they end up with high blood sugar or gestational diabetes. Will I have diabetes after I have my baby? out whether your blood sugar level is back to normal. If you have gestational diabetes, you are at higher than normal risk for developing type 2 diabetes later in your life. Keeping your weight within a healthy range and keeping up regular, moderate physical activity after your baby is born can help lower your risk for type 2 diabetes. Can I breastfeed even though I have gestational diabetes? Like all mothers, women with gestational diabetes should breastfeed their babies, if possible. Breastfeeding not only provides benefits for your baby but is also beneficial for mothers. It allows your body to use up some extra calories that were stored during pregnancy. Losing weight after having the baby enhances overall health and is one way to reduce your chances of developing diabetes later in life. Many women who have gestational diabetes also find that breastfeeding improves their fasting blood sugar level and allows them to maintain a lower average blood sugar level once their babies are born. If you know that you want to get pregnant in the future, have a blood sugar test up to three months before becoming pregnant to make sure you have a normal blood sugar level. If your blood sugar level is high, you may have developed type-2 diabetes without knowing it. It's important to get your blood sugar level under control before you get pregnant. If you do get pregnant again, make sure your health care provider knows that you had gestational diabetes with your last pregnancy. If you had gestational diabetes with one pregnancy, your risk of getting it with another pregnancy is about 36 percent. Stay FIT with regular exercise and it also improves blood sugar levels. For women with gestational diabetes, a healthy diet helps to keep blood sugar levels in the healthy target range. To promote health throughout your pregnancy, it is essential that you workwith your health care provider to create a plan for your healthy diet. Carbohydrate counting helps you keep your blood glucose levels in target. This is important because gestational diabetes cause your blood glucose levels to go too high. Eat 3 meals and 3-4 snacks each day at regular times. Avoid skipping meals. You may need to eat fewer carbs at breakfast. Try starting with 2 carb choices, or 30 grams of carb. Still hungry? Add meat, meat substitutes, or nonstarchy vegetables to your meal to help fill you up. Eat consistent amounts of carb at meals and snacks from day to day. WHAT ARE SOME FOODS IN THIS GROUP? These foods give you essential fatty acids and vitamins. Choose a diet that is low in saturated fat, trans-fats, and cholesterol and moderate in total fat. Use vegetable oil srather than solid fats (such as those in meat or dairy foods and shortening). Milk and milk foods give you carbohydrates, proteins, and vitamins and minerals. Choose milk, cheese, and yogurt products that are fat free or low fat (1%). These foods provide protein, vitamins, and minerals. Trim extra fat off meats, including the skin. Use broiling, grilling, and roasting to cook meats without adding fat or cholesterol. Vegetables, either raw or cooked, give you carbohydrates, vitamins, minerals, and fiber. Fruits give your body carbohydrates, vitamins, minerals, and fiber. This group gives your body carbohydrates, vitamins, minerals, and fiber. Whole grain products are high in these nutrients. Avoid high-fat or fried tarchy vegetables and grain products. "Free" foods are those that have less than 20 calories. Water is considered a "free" food; you can drink as much water as you want.In fact, most health care providers recommend that you drink a lot of water when you are pregnant. Drinks: sugar-free/ unsweetened and low-salt versions of broth, bouillon, consommes, mineral water, club soda. Fruits: 2-3 servings each day. Choose whole fruit instead of juice when possible. Grains, beans and starchy vegetables: 6 or more servings each day. Look for whole grain and high fiber foods. Sweets: keep portions small. Count the carbs. Fats: choose healthier fats. Limit saturated fats. Avoid trans fats.